What is the payoff of a business using video marketing? Well, the payoff is measured in how the video marketing platform engages consumers. 46% of consumers that view video ads, take action afterwards. 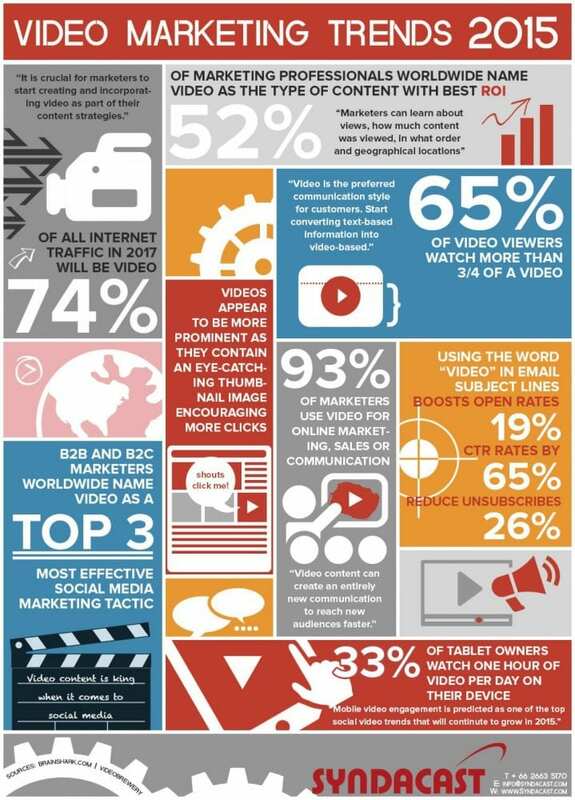 By 2017, 74% of all internet traffic will be video. Video captures consumer attention in a way unmatched by other advertising platforms. Plus 65% of consumers are guaranteed to watch at least 3/4 of a video. What other advertising platform offers that level of consumer attention capture? Nothing can guarantee consumer attention like video. Today’s share comes from Syndacast. Their infographic understands that video content can create an entirely new way to reach audiences faster. Look at how video content has become king when it comes to social media. Audiences want the material fast, first and customized. It doesn’t matter if your business is selling Red Hat servers, HVAC units or security software…the new consumer base wants it now. While today’s stats are an overview of what the marketing world has learned in the last year, there is a path moving forward. Feel free to browse today’s infographic and find follow-up info in Autodemo’s knowledge base blog. Come back tomorrow (July 7th), as we examine the impact of video marketing over text.